CAP National Commander Brig Gen James C. Bobick presented Spaatz Award #1423 to Colorado Wing’s C/Col Melissa Bland in recent ceremonies. General Bobick noted in his remarks that C/Col Bland is the only cadet to whom he has presented all four CAP milestone awards: the Billy Mitchell Award, the Amelia Earhart Award, the Ira C. Eaker Award and the Carl A. Spaatz Award. 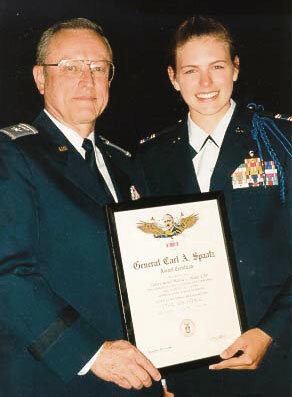 C/Col Bland joined CAP in November, 1995. She is seeking a nomination in either the U.S. Air Force Academy or the U.S. Naval Academy and hopes to become a fighter pilot. She is currently a high school senior in the Denver area. Both of C/Col Bland’s parents are pilots; her mother flies Boeing 767s for United Air Lines. A number of Spaatzen attended the July 2000 reception honoring C/Col Bland: (from left) C/Col Bland (1423), C/Col Sean Williams, Spaatz #1412, C/Col Royce Lippert, Spaatz #1380, his twin brother USAFA Cadet Ryan Lippert, Spaatz #1339, USNA Midshipman Phillip Casha, Spaatz #1320, and CAP National Legal Officer, Colonel David N. Simmons, Spaatz #447.